Holiday Car Finders are an English-run car rental broker company based in Gran Alacant on the Costa Blanca, Spain. They required a website to promote their company and allow them to streamline their booking system by encouraging customers to book online. In order to reward customers and generate brand loyalty they wanted to give a discount to any customer that has previously booked online. They also wanted to be able to update the car pricing whenever it changed and place special offers on the site whenever one was available. A database driven website was built that allowed visitors to enter a few details of their requirements and receive an instant online quote. The customers then have a choice of converting the quote into a booking by entering a few personal details. The website includes a complex online quote calculation module that computes the quote according to the length of time, car group requested, the time of year and discounts for previous customers. In order to streamline the quotation and booking taking for the business a system of HTML emails was set up. Once the customer places a booking they are informed by email that the booking has been received. 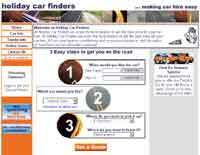 Holiday Car Finders also receive an email with the booking details. Holiday Car Finders simply check the details on the email and make any changes required and click Confirm and the booking is made. Hex Designs content management system was added to the package to allow them to easily update the car details, the car prices, any special offers and how much discount to give returning customers.